One of the finest Irish dance troupes available in the UK and Ireland, many of whose dancers are championship medal winners. In March 1998 Celtic Feet produced a full theatre show called ‘An Evening In Ireland’ which was launched to huge acclaim. Since this they have performed at many of the UK’s most prestigious venues. The Celtic Feet concert is possibly the only entirely Irish show available and is more of a variety show than a ‘sit down and watch’. Unlike other shows it is not a pseudo-Irish dance show, and they have resisted the efforts of commercial enterprise to adapt to a more themed or ‘storyline’ format. 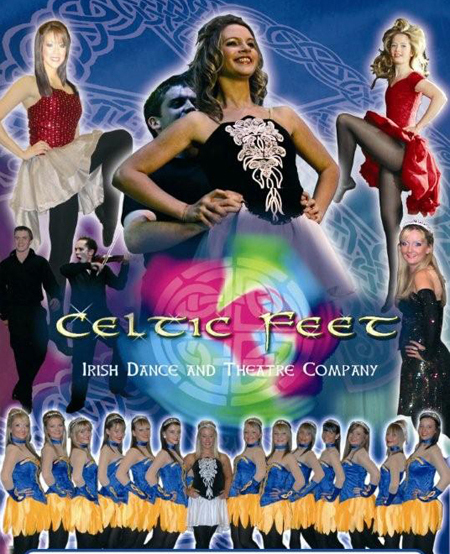 It is a live show, the dancers you will see are all Irish dancers who have trained for many years, many of them still actively participating in competitions. 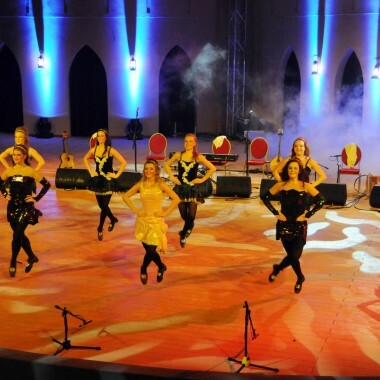 Concerts include both traditional and contemporary dance, including some routines that have never before been attempted by the ‘well known shows’, indeed the choreography is far more complex and difficult than any previous Irish dance show. Routines include the Sean-N-s (the oldest form of Irish dance still practised – predominantly in the Western Isles and the Isles of Arran, generally danced by the older generations) mixed with Outrageous and The Corrs – Toss The Feathers (both Celtic Rock routines). 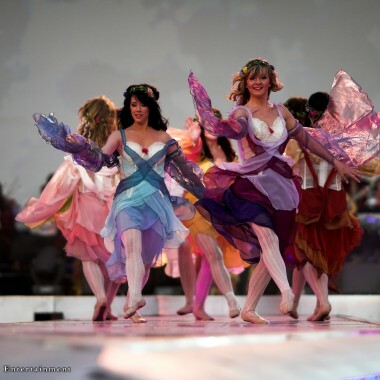 Butterfly is danced in traditional Irish costume (which we also believe no other dance production includes). Theatre productions and corporate engagements are varied dependent upon particular requirements and the anticipated audience. Occasionally they also include special guests. In previous years, Celtic Feet were honoured to be selected by the Irish Tourist Board in Dublin to represent Ireland at the launch of the Tour de France in the Palais de Congress, Paris, in the presence of President Chirac. They have also danced as guests at a Royal Ballet production and made an appearance at the Omagh fund raising concert. Recent engagements include: appearances at Euro Disney Paris; The Disney Theatre, Stuttgart; a 16 day theatre tour in Denmark; and summer shows in the Channel Islands. Recently Celtic Feet have diverged into the festival world with a highlight being an electrifying appearance to a capacity audience of 35,000 at the Dranouter Folk Festival in Belgium. The former Female lead dancer of the Celtic Feet Dance and Theatre Company is Roisin Turley-Gibbons, who was five times World Irish Dance Champion. These days Roisin concentrates on choreography. She was recently requested by Robert Wagner Entertainment GmbH to choreograph dance scenes and co-ordinate dance and acrobatic scenes between Celtic Feet and Feuervogel acrobatic company in the hit musical production of “Excalibur the Celtic Rock opera” which opened in Kaltenberg Arena to sell out audiences of 10,000 per night and received rave reviews. Roisin co-choreographs Celtic Feet Dance with Marion Turley-Gibbons.Marion is one of the most successful teachers and choreographers of Irish Dance in the world. She has trained 40 World Champions to date – an unsurpassed record – and also trained some of the cast of Riverdance and Lord of the Dance, including Jean Butler the original Female Lead in Riverdance and Colin Dunne who took over from Michael Flatley in Riverdance and starred as male lead for 3 years. Colin is now a very respected dance judge on Irish Television. Marion has also choreographed several shows for ITV television including, The Magic Fiddle (which won the Golden Rose of Monteux, Documentary category) and Cricket and Wellies. In addition to being one of the top Irish Dance choreographers in the world, Marion is also a former recording artist and toured with several folk Bands including the The Campbells. H.R.H. The Queen, H.R.H. Princess Anne, Sir Richard Branson, Glaxo Smith Kline, The Labour party, Royal Caribbean, Eddie Jordan, Siemens, American Express, Bluebird Toys, Doc Martins, Pfizer, Suchard, Tetra pak. Richard and Judy, The Magic Fiddle an ITV short documentary film staring Celtic Feet and choreographed by Marion Turley (this film won the Golden Rose of Montreaux, documentary category), Midlands Today.